When I went to Guyangan for the first time in February 2016, the path to get down the cliff was very impressive. Part of the staircase was made of wood and you had to have faith in the strength of the bars. I remember posting a picture with the caption "a misstep and you're dead". And in case of accident, there was no one to report it. When I returned recently I saw that the whole staircase is brand new. The descent is now much easier and less impressive. Or maybe I got used to it! Guyangan Waterfall : but where is the waterfall ? The place is called Guyangan Waterfall or Peguyangan Waterfall on Google Map. It is one of the very beautiful places of Nusa Penida. 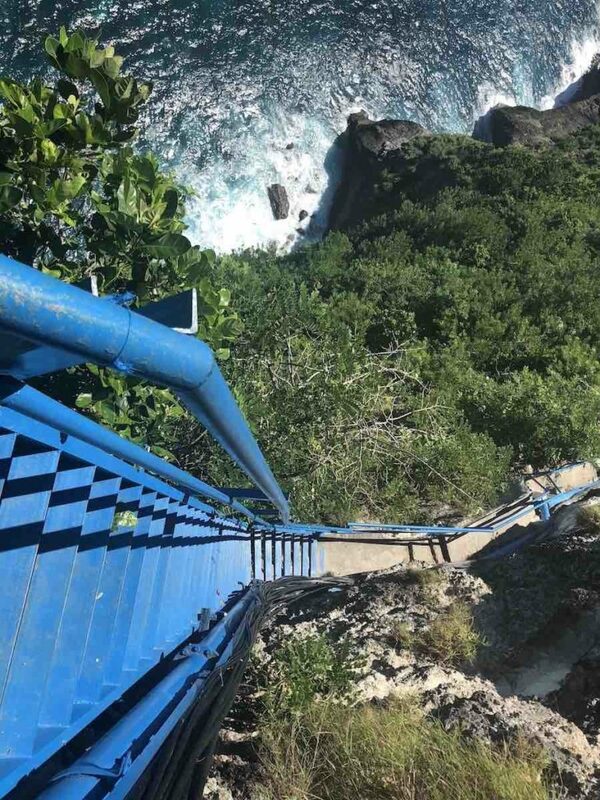 But if you are expecting a cascade of water falling from the cliff you will be disappointed. The only small waterfall you will see is the overflow pipe of the small water tank in which the pumps come to draw the spring water that will be distributed on Nusa Penida. Guyangan is fairly easily accessible, about 50 minute drive away from Crystal Bay or Toyapakeh. Ready to get down ? Guyangan is an awesome place and holds its success of three factors. 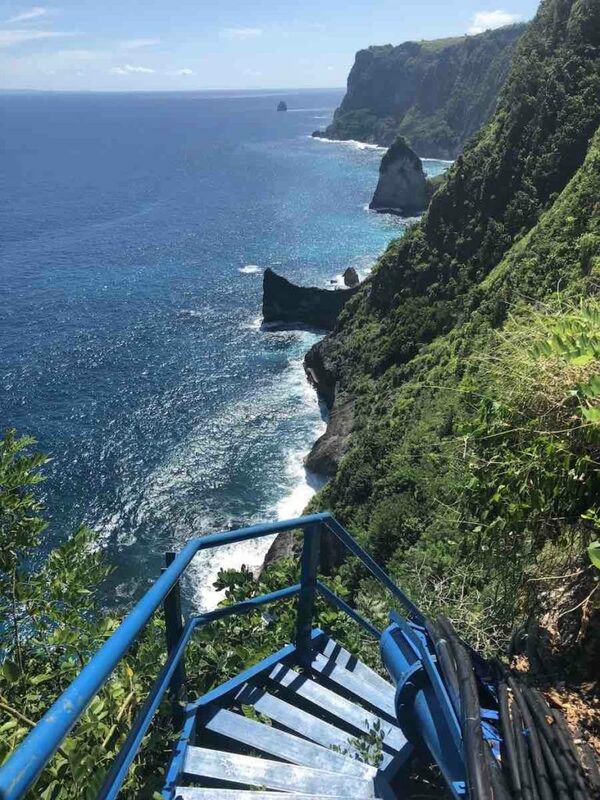 First the blue staircase that goes down along the cliff and allows beautiful pictures. Then, the breathtaking view of the cliffs of Nusa Penida. And finally, down the stairs and after crossing a small temple, a natural pool sculpted into the rock of the cliff. You can cool off after a descent that could be described as dizzying. And above all you can safely face the waves that break on the edge of the cliff. Guaranteed sensations ! You will also see downstairs a rather nice temple. Do not forget to take your sarong because otherwise you will have to rent one at the top of the stairs before going down. I am not sure who is represented by the three statues dressed in blue, white and red. But I’m pretty sure it has nothing to do with the French flag. If you know more, thank you for telling me in a small comment at the bottom of this article !